My friend, Deryn Mentock, had a grand idea. Twelve artists should make Christmas ornaments for each other and send them to be opened on one of the 12 days of Christmas. With Deryn as the hostess of the swap, that is exactly what we have planned and when Somerset Studio found out, they published an article about it. 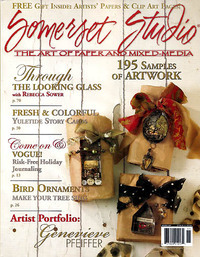 Check out the great pictures of our ornaments in the current Nov/Dec 2007 issue, p62 - 65. Of course, my ornament (pictured above) is a nontraditional one - think Weird! I was eager to try my hand at manipulating a piece of silverware so this swap was my first opportunity. I used a butane torch (not really hot enough so I won't be doing it with that kind of torch again.) and worked and worked to quickly get a coil in the fork tines before they cooled off too much to bend. I eventually managed but I recommend a hotter torch -- like mapp gas or something. After I got the "hair" done, it was simply a matter of arranging and attaching the elements of the body with cold connections. Can you find the tiny screws holding the wings on? The legs, as you can tell, are skeleton keys with chain wrapped around them. I used teeny tiny nuts, screws, bolts and itty bitty brads as well as jump rings to connect everything except the vintage typewriter key "face." That I merely glued onto the fork. I even used a brad to attach the bow in her hair! Several of the artists have posted more information about their ornaments on their blogs. For example, Kelly Snelling has a wonderful full explanation of the motivation and techniques she used to make her prayer pillow. (picture of front of pillow below.) You might notice that in the article you only get to see the back of Kelly's ornament pillow. Now that the article is out, more of the artists will probably make blog posts about their ornament. Check out this second lesson synopsis and more pictures by clicking on the title in the upper right sidebar of this blog. Trust by the town of Cochran, AB Canada mural team. Over 200 artists supervised by Lewis Lovoie. You're gonna love this! I found this intriguing art linked in a post on Altered Route, a blog of altered art, mixed media, and shared learning & fun. I found Altered Route from my Recent Readers list (in the right sidebar of my blog.) I love finding new blogs to visit and Altered Route is a particularly interesting one with varied types of posts. . . mixed media art, techniques, interesting links, tips on free stuff, and on and on. I enjoy reading this blog because there is always something worth exploring. 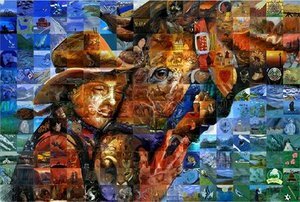 This is a mural from Lewis Lavoie's Mural Page on his engaging website, Mural Mosaics. (I picked this one out for you, Deb.) This mural is made from 216 paintings! From the mural page, you can click on each piece of the mural to see the individual paintings in detail. Just go to the Mural Page and click anywhere you would like to see the individual painting.
. . . and there is a You Tube movie of one of the murals on the Mural Mosaics home page. Can you imagine doing a mural with over 200 artists??? A couple of weeks ago, my dear friend and talented artist, Deryn PAIGE Mentock, tagged me for the Middle Name Game. 4. When you are tagged you need to write your own blogpost with your own middle name game facts. 5. At the end of your blog post, you need to choose one person for each letter of your middle name to tag. 6. Don’t forget to leave a comment telling the folks you tag they’re tagged and to read your blog. 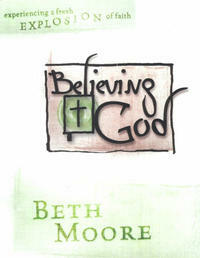 R . . . is for Religious Iconography. It's everywhere . . .
U . . . is for Underground, as in Alice Underground. Oh, how I love those charming characters that came from the imaginative mind of Lewis Carroll! I even have a collection of books ABOUT Alice and about Lewis Carroll. My kitchen has a corner dedicated to Alice. My all time favorite Alice illustrator is Anne Bachlier. Her paintings for the tale are a fantastic collection. T . . . is for Tools, Tools, Tools. Yummy, how I love my tools. Love to shop for them. Love to shop more, buy more, and organize all over again! Oh, how I love my tools... especially my new TORCH and all it's paraphernalia. See my new tall torch table? One of our major department stores just went out of business and I bought this tall display table. Since I got experience with a torch in Susan Lenart Kazmer's class, I've been dying to set up my own area for torching things... (I'm still a little scared of that TANK.) Haven't actually USED the torch yet -- but it looks good, ya gotta admit. And all those Iris cart drawers for pliers and hammers and metal - oh my! Pliers and hammers and metal, oh my! H . . . is for my Husband of 40 years! He knows me and loves me anyway. Knows my strengths and tells me about them. Knows my weaknesses and never mentions them. Knows I HAVE to be right and lets me be right... even when I'm wrong. Knows I can't handle criticism and never criticizes me , even behind my back. Knows I don't like to clean the kitchen, so he does it. Knows I'm a procrastinator, so he pays the bills.. . Need I go on? Woohoo! I hit the Jackpot. Sorry, gals, the best one is taken. Not perfect, you understand, but when he snores or leaves the water running or wakes me too early with a pep chant to get me up to go to the gym to work out or gets on his all fours to crawl into the bath room barking like a dog and scares the peewaddle outta me (yeah, well, he'd have to be nuts to marry me, right?) ... ... I just try to think how I'd miss all those aggravations if I didn't have him around. I love you, Jer.